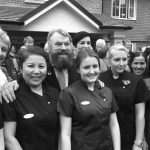 Lakeview, our new care home in Lightwater, Surrey, was officially opened today by legendary actor and local resident Brian Blessed. 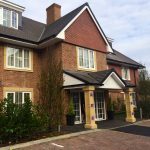 Brian declared the home open in front of over 200 guests and gave his backing to what he called a “brilliantly designed and brilliantly thought-out care home”. The day started with a champagne reception in Lakeview’s ‘Woodland Café’, which serves complimentary drinks and homemade treats. Guests were then given tours of our much talked about new home, which will provide residential, nursing and dementia care. Lakeview, which wowed over 400 local people at a recent community open day, features our award-winning facilities such as Cinema, Hair Salon and Therapy Room. The design innovations continue within the home’s dementia community, which features a Residents’ Laundry Room, designed to encourage independent living, and the ‘Haven’ – a cosy sensory room. The gardens, designed by an award-winning architect, are easily accessible and feature a summerhouse and greenhouse. Outside space is accessible upstairs too, with an Orangery leading onto a stunning roof terrace overlooking the ground floor courtyard. 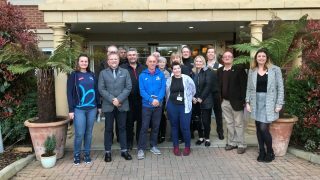 The Mayor of Surrey Heath, Bob Payton, was also in attendance and described the home as “the most fantastic facility I have ever seen” before handing over to the energetic Brian Blessed who gave a heartfelt and rousing speech before declaring the home officially open.